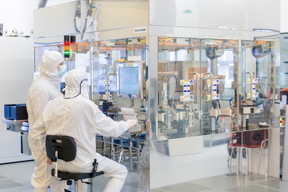 Leti, a research institute at CEA Tech, today announced during IEDM an extension of its 300mm silicon-based wafer line to open new R&D avenues for its industrial partners. This extension will allow new innovative technological modules to be inserted in, or made compatible with, industrial flows up to completely pioneered technology routes that enable edge AI, HPC, in memory computing, photonics, power electronics and other high-end applications. CEA-Leti’s 300mm wafer-line extension will accelerate innovation projects with fab partners using 300mm wafers. CEA-Leti's advanced CMOS strategy targets FD-SOI research through the development of modules to the economic and technological limits of scaling, and complements the extension of the 300mm platform for edge-AI applications, analog applications, RF and power electronics. This strategy is based on a mix of priorities of CEA-Leti’s partners and its researchers’ ideas that pioneer enabling technologies to address societal challenges. These include cloud and edge computation, high-volume communication, multi-modality interaction and energy conservation. Leti executes the strategy with its fully implemented technology, from beginning to end with module-level innovations, such as insulation or back-end copper, as well as devices and their architectures. The implementation of this 300mm line is possible thanks to the financing of Auvergne Rhone Alpes region for the acquisition of a 193nm immersion lithography tool, which is the cornerstone of this investment plan (2017-2018). CEA-Leti also benefited from financial support of the French government for the second phase of this plan (2018-2019).